Pete’s writing experience is vast, spans many genres and can be heard in a wide variety of contexts. He is a highly respected lyricist and is also one of the few songwriters that have the necessary skills not only to perform his music in an intimate setting but also to arrange and orchestrate it for large scale forces. Very rarely does Pete simply write his music and ‘send it off’ to the commissioner – especially in educational situations. He tends to be present at every step - from the introductory workshops, through the subsequent rehearsals and ultimately he can be found ‘directing traffic’ at the command performances. The biggest children’s opera ever written. Created, performed and recorded by children, this will be a project involving 216 countries – including all nations participating in the Olympics London 2012. A thrilling tale of adventure and a breathtaking round-the-world trip, collecting a ‘ring’ of truth from each place visited, expressed in different musical styles and song. Settings of Palestinian and Native Canadian poetry for Soloists, SATB choir, Rhythm section and Horn section. Commissioned by The National Youth Choir of Great Britain and premiered at The Barbican in April 2011. A Song Cycle for Soloists, Unison choir, SATB choir, Rhythm section and Big-Band with strings and woodwind. 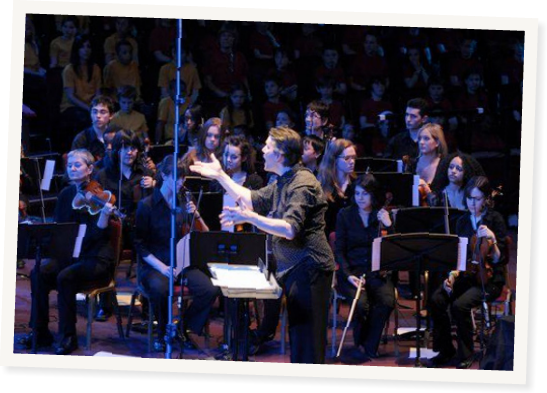 Commissioned by Merton Music Foundation and premiered in March 2011 at the Royal Albert Hall. Written in collaboration with the London Vocal Project and the children of Merton. A song for the London Olympics 2012. Commissioned by the ten ‘Gateway’ boroughs. Scored for Soloists, SATB choir, rhythm section and horn section. Premiered at Sadlers Wells, London in January 2010. An Oratorio for Soloists, Unison choir, SATB choir. 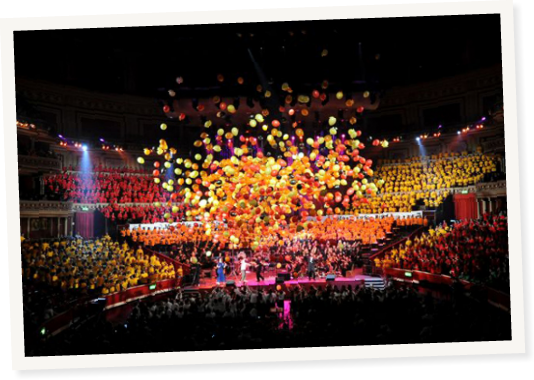 Rhythm section, Horn Section and ‘World Music’ ensemble with strings Commissioned by Merton Music Foundation and premiered in March 2009 at the Royal Albert Hall. An Oratorio for Soloists, Unison choir, SATB choir, Rhythm section and Big-Band with strings and woodwind. First Performed as a musical (with book) 1988 – Special Award in Vivian Ellis Prize 1988 – reworked as an oratorio and presented at The Royal Albert Hall in 2003, this expanded version was premiered at The Royal Albert Hall in March 2007. A choral arrangement for SATB choir and Brass Band commissioned and premiered by The Halifax Choral Society and The Black Dyke Brass Band in 2006. A Fanfare for Brass Band, Drums and Percussion commissioned in for a performance in March 2006 by the State of Jersey on the occasion of the retirement of the Lieutenant Governor. A multilingual Oratorio for Soloists, Unison choir, SATB choir (optional), Rhythm section and Big-Band with full orchestra (optional). Originally commissioned by Barking and Dagenham Music Services for a performance in February 2004 this expanded version was premiered at The Royal Albert Hall in April 2005.
section and Orchestra (optional). Marylebone C of E High School commissioned this piece for Girls for a Christmas concert in December 2005. A choral work for Soloist, SATB choir, SAT choir, Unison choir, Rhythm section and Orchestra (optional). Marylebone C of E High School commissioned this piece for Girls for a Christmas concert in December 2004.